Nothing’s more annoying than an athlete wristband that’s flopping around and chafing or that feels small enough for a 6-year-old to be wearing it. That’s not what you need to distract you on race day. Can’t take it off, of course (unless you don’t want to be able to get into transition or to take your bike home with you). So you have to be careful putting it on. Enter this easy solution for a perfect-fitting wristband every time. 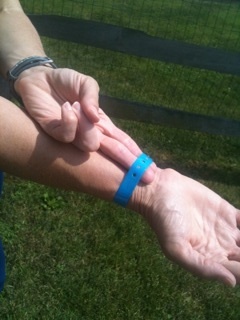 Just slip two of your fingers under the wristband when the volunteer is putting it around your wrist. For me (and others I know who’ve used the technique), it’s not too tight, not too loose. And not a concern on race day. Let me know how it works for you.